The internal bisectors of the three vertical angle of a triangle are concurrent.This point of concurrency is called the incentre of the triangle..The incentre is denoted by I. Let ABC be a triangle whose vertices are (x₁,y₁) (x₂,y₂) and (x₃,y₃). 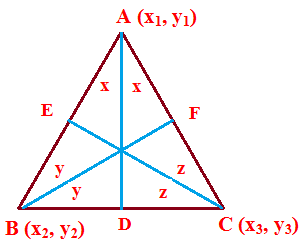 Let AD,BE and CF be the internal bisectors of the angles of the triangle ABC.The incentre I of the triangle ABC is the point of intersection of AD,BE and CF.